My name is Thelma Stump. I am from ?Esdilagh First Nation, a member of the Tsilhqot’in Nation. I attend the Cariboo Field Centre and presently, I am in my second year as a NITEP student. Why did you wish to become an educator? I was inspired to get into teaching to share Tsilhqot’in ways of knowing in education. 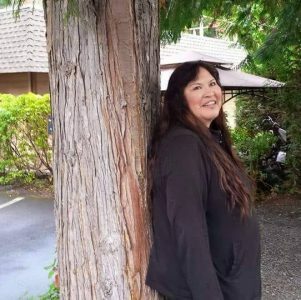 I decided to pursue my goal to become an Indigenous Teacher. Currently, I am an Indigenous Support Worker in School District 28. However, I want a teaching position that gives me an opportunity to help students realize their own potential. I would like to teach students in nearby Cariboo communities. Why do you value Indigenous education? What I value most about the Indigenous education is that educators are finally bringing their own traditional cultures, their own languages, their traditional sacred sites, and their traditional lands into the classrooms to teach. Many of our students are not provided with an opportunity to learn their Indigenous languages. I am working towards preserving and teaching our own Indigenous languages inside and outside the classroom. What is most important to you as a NITEP student? We are all going to be Indigenous teachers at the end of 4 years. We will be teaching Indigenous curriculum. To help students better learn about their cultures, we can invite Indigenous knowledge keepers to share their songs, storytelling, connection to the lands, and even the cycles of life using the medicine wheel. What are your future goals once you complete the NITEP program? I am working towards being able to teach in our communities. I want to be able to help other teachers and learners about reclaiming our cultures with the help from our Elders, Spiritual Leaders, Knowledge Keepers, and Land Keepers who may share their stories. It is important to share this knowledge with the younger generation of Indigenous students to help them learn from our teachings.